﻿ Best Price on Emerald View Resort Villa in Montego Bay + Reviews! Have a question for Emerald View Resort Villa? 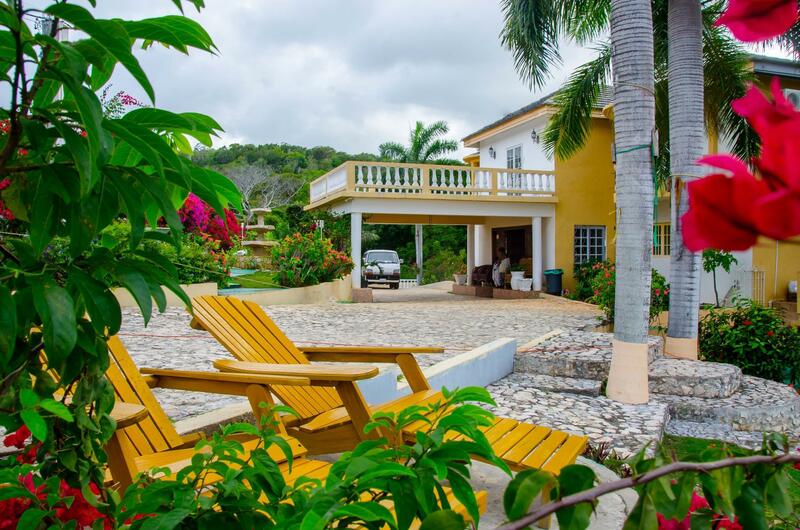 Situated in Montego Bay City Center, Emerald View Resort Villa is the perfect place to experience Montego Bay and its surroundings. Set 14.0 mi from the excitement of the city, this 3-star hotel commands an excellent location and provides access to the city's biggest attractions. This modern hotel is in the vicinity of popular city attractions such as Greenwood Great House, Martha Brae River. At Emerald View Resort Villa, every effort is made to make guests feel comfortable. To do so, the hotel provides the best in services and amenities. Free Wi-Fi in all rooms, daily housekeeping, taxi service, express check-in/check-out, luggage storage are just a few of the facilities that set Emerald View Resort Villa apart from other hotels in the city. In addition, all guestrooms feature a variety of comforts. Many rooms even provide television LCD/plasma screen, linens, mirror, private entrance, towels to please the most discerning guest. The hotel offers fantastic facilities, including boats, canoe, watersports equipment rentals, snorkeling, golf course (within 3 km), to help you unwind after an action-packed day in the city. Emerald View Resort Villa is a smart choice for travelers to Montego Bay, offering a relaxed and hassle-free stay every time. the view from the room and a hammock is absolutely mesmerizing! Lovely and accommodating owner of villa, Jennifer, pointed us to all best sights and deals around. As we came back every evening completely exhausted from sightseeing our room was already clean, neat and ready for dozing off travelers. Villa is secured, located in quite neighborhood and guarantees good night sleep. when we drove up to the top of the hill, i was not to happy about the areas i had to pass to get to the villa, its not a good place to walk anywhere. i did not see any street lights coming up the long road, also there are several bushes along the walkway. my fiance lives in jamaica and said its not a good place for tourist to walk around.you will need a car. the room was clean.the tub needs to be re painted.my fiance had to ask 2 times about the password for the wifi and for some ice.the lady did not move the first time and when he went back for ice again,she was sitting in the chair on the computer.when i got mad and went down to get the ice and password, she says she must be tired and thats why she cant remember the password,i told her if she was that tired,she need to go to bed.when i got the ice to put in my cup,i notice plastic bag paper in my cup.when my fiance started drinking his water a piece of plastic bag got stuck in his throat.he told me he seen the owner with the ice in a plastic bag chopping ice.the place seems deserted.i will never stay there again.the only thing i liked was when i went to dinner at a place call the chill out spot.emerald view had an area that suppose to be a bar,but it looks like it have not been used in awhile.they had a dining area and kitchen,but no one was in it.we left as soon as we woke up.my fiance wanted to leave as soon as we arrived, but i told him we will stay since its booked, but not another night.its bad when a jamaican resident dont want to stay at hotel in his own country where he lives. i stayed 4 nights at emerald view and loved it.this was not my first time in jamaica. the resort is clean and charming. photos do it justice. lovely bed & breakfast fantastic view of mo-bay. the inn is set up high on a hill. the view is incredible.the house is run. this women could not have been more hospitable.she is kind and honest and makes you feel like your visiting a friend.excellent tour guide.reasonable prices,take advantage of her service. Very peaceful, good for relaxation after flying a long distance. We were exhausted from long flights and were only too glad to have a quiet place to sleep it off. The villa provided shuttle service down to the nearest beach or to restaurants in the evening plus picking up. Quite a convenient first stop. This is a simple, family run hotel in a beautiful location, about 20 minutes from Montego Bay airport. Basic breakfast, lunch and dinner options; bar; good wifi; airconditioning in bedrooms; clean saltwater pool. It is not located in walking distance to any attractions, so plan on paying for a taxi or renting a car. The owner is very knowledgeable about her island and can help you plan day trips. our room was a good size, and the ac and hot water both worked great but...i made a reservation for an ocean view room, and our room had a view of the driveway. the hot water was great, but the tub was clogged so each time we showered we were standing in bath water that couldn't go down the drain. the ac worked great, but they shut it off each time we left the room so we came back to a humid room instead of a comfy, cool room like we wanted after a trip to the beach. the website claims the hotel is walking distance to the beach, but that is absolutely not true. it is at the top of a big hill with a very twisty and pothole-filled dirt road. there is a shuttle service for only $25 each way, but if you can't get in touch with the shuttle driver, cabs charge close to 50 bucks to drive you back to the hotel (which is almost half an hour from most of the resorts and the hip strip, which is also not what the website says. )my biggest issue though was that there was a child constantly in the hotel who followed us around when we left our room, trying to take pictures of us, blocking us from going up the stairs or back into our room until we played games with her, and who cried loudly multiple times each day and night. when i go on vacation, i want a break from kids, not to hear one screaming while i'm trying to relax. however, i wanted a bargain hotel, so i guess we got what we paid for. i would recommend paying a little more for a more convenient (and child-free) spot. This was a beautiful and peaceful villa on the hillside of Montego Bay. Wonderful views of ocean from the property. I felt like I was visiting family rather than staying at hotel. The staff was friendly, helpful, and made sure I enjoyed my visit. Definitely not like staying in a Hilton or Holiday Inn, much less formal and much more home-y. Great place to relax, sleep, and meditate. I was shuttled anywhere I wanted to go, and after spending a day in downtown Montego Bay, I was happy to get back "home." I took walks and meet neighbors, watched a soccer game, ate authentic Jamaican food-- definitely "experienced" Jamaica, rather than just visited like a tourist. This is a family-run business, and it truly shows. A taste of Jamaica away from the main tourist drag, outside Montego Bay, rather like staying in a Jamaican family home. A lovely house designed by the equally lovely Jennifer, owner. A nice friendly informal atmosphere among the guests as well. There are enough things to do and see on this side of Montego Bay, including the fascinating Greenwood Great House (former plantation / slave-owners home) and trips csn be organised with the villa shuttle, for example to go river rafting. Daytime free shuttle down to the beach is great and the Chill Out Hut has clean sand, safe swimming, restrooms and restaurant facilities for a lovely relaxing day. After dark it's necessary to make your own transport arrangements to get back up the hill and local taxis are scarce. Next time I might use a rental car for ease of access. But I think there will be a next time. the hotel is neat and clean and the views are lovely. it is nice to be away from the tourist trap city centre of town. it is a fair way from the the airport, so book the hotel shuttle as it is half the price of a taxi. the staff are wonderful and very helpful. there is a free shuttle to and from the beach (which is a short walk away). they have a driver who will take you around for day trips. this works out far cheaper than cabs and is a much more personal and interesting experience. Nice hotel, great view, 10 mins from Jazz Festival service with a smile. My stay was good, staff friendly, nice and quiet and the food was good. 10 mins from where the Jazz Festival is kept this was perfect for me, will be staying there next year for the festival. Room is nice and cozy, I would definately recommend this hotel. Sehr freundlicher Empfang. Leider war das Frühstück außerhalb der Saison etwas mager. Zudem war es nicht möglich abends einen Snack oder einen Drink zu bekommen, da die Bar außerhalb der Saison nicht betrieben wird. Es wäre zumindest schön etwas Cola/Wasser vorzuhalten. Der Pool hat schönes Meerwasser und ist 24h am Tag zugänglich. equipe atenciosa, ambiente tranquilo e internet rápida. ao chegar ao hotel, fomos surpreendidos com a cobrança de uma taxa de limpeza que não havia sido informada quando fizemos a reserva pelo site, no valor de us$ 20,00 por dia. consideramos essa cobrança absurda e abusiva, além de inusitada, pois nunca havíamos ouvido falar de tal prática em nenhum hotel. no mínimo isso deveria ter sido informado quando da confirmação da reserva on line. ficamos com a sensação de que estávamos sendo enganados. apesar disso, o hotel, embora seja simples, oferece boas instalações para quem busca um lugar tranquilo para descansar. as pessoas que trabalham são atenciosas e amigáveis. a localização não é muito boa, pois fica deslocado do centro, mas se tiver um carro isso não será problema.